Cardinal Aloysius Stepinac saved hundreds of Jews in war-torn Croatia but, amazingly, is still considered a war criminal by many. Sharyn McCowen talks to a Jewish academic who says the world has got it all wrong. 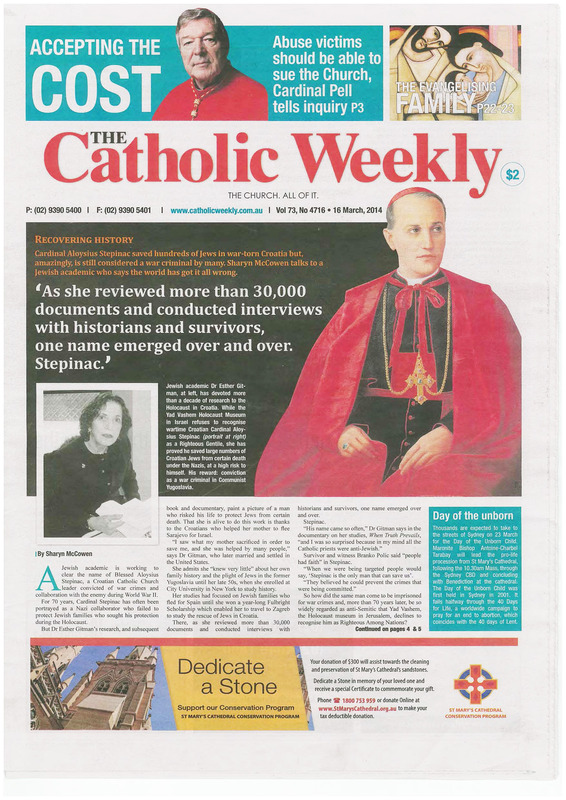 A Jewish academic is working to clear the name of Blessed Aloysius Stepinac, a Croatian Catholic Church leader convicted of war crimes and collaboration with the enemy during World War II. For 70 years, Cardinal Stepinac has often been portrayed as a Nazi collaborator who failed to protect Jewish families who sought his protection during the Holocaust. “In 1946, prior to Stepinac’s trial, the Communist Party had published a book that contained forged and carefully selected and edited documents designed to make Stepinac and the Catholic Church look bad. And so the communist lies about Aloysius Stepinac took a life of their own, portraying him falsely as a symbol of the Holocaust in Croatia, instead of a symbol of the rescue of Jews in Croatia during the times of the Holocaust! As the communist Yugoslavia authorities had forbidden access to the original documents pertaining to WWII rescue of Jews in Croatia and locked away the multitudes of boxes containing these, Dr Esther Gitman was the first scholar who had been able to research these documents thoroughly after Croatia had seceded from the communist Yugoslavia in the 1990’s and opened up its WWII archives for research. Thank you for the reblog, Mishka Gora! Bravo Dr. Gitman! Thanks for the post, Ina! Thank you for the reblog, Barbara! Indeed it’s wonderful scottishmomus , even if it will taken a while for some to come to terms that they’ve been fed lies all these years when it comes to Stepinac. It’s easy to see who we can consider our friends and where our allegiance in terms of foreign affairs should be gravitating towards. 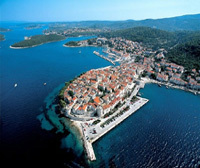 Croatia needs to strengthen ties with those with whom we should be cooperating. This certainly should not include neighbours who have denied us all access to archives and who have destroyed important documents and other evidence that could reveal historic truths that have carefully been kept from both historians and the general public for decades. Our strategic interest should focus more towards people who have a strong interest in getting to the bottom of dubious historical records, regardless of how uncomfortable this makes those who are responsible for them. Yes indeed, Brankec – a relationship is a two way street and it’s a pity the Croatian government doesn’t seem to care about that especially when it comes to owning up to and revealing the truth … the “mileage” one may get by concealing or destroying evidence of truth is so temporary in the scale of life for truth has a way of finding itself…sadly though suffering does occur till then. Some of Croatia’s neighbours and indeed some of Croatia’s politicians have the gall to call the revelation of historic truth, a historic revisionism with negative connotations so one cannot rely on them at all…best strengthen relations with those who recognise the truth for what it is and who know how to admit a mistake when a mistake is made, and move forth in greater enlightenment rather than bitterness because their truth has been proven a lie. All else I can say is, thank you, Dr. Gitman. 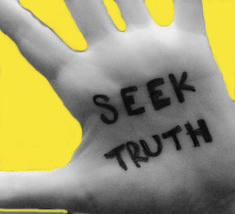 The world needs to know the truth no matter because myths only hurt every victim of totalitarian regimes. I hope in time the world will open its eyes and understand how important all of this is. Hi Ina, My dad told me a story once of when Stepinac was in prison awaiting trial and that the UN or similar organisation visited. The prisoners were told by the guards to yell abuse at Stepinac so that the authorities could then tell the UN or similar organisation that Stepinac was despised. Once these visitors entered the prison, instead of abusing Stepinac, the prisoners all knelt an prayed thus humiliating the Communist Officials. what an interesting story. There must be so many more things to uncover out there. Thanks, psychologismimi, I guess uncovering the real truth is quite a job especially when history was written by those in whose interest it was not to say the truth but to make up things that suited their political agenda. Communists were specialists in such undertakings and researching archives once they are open to public and researchers brings home the picture that is entirely different to what they fed to people.